In what is possibly Maine’s most urban place, Congress Square Park is centrally located in downtown Portland, across from the Portland Museum of Art. The park was created through an urban renewal project funded by an Urban Development Action Grant in the early 1980s. The goal was to make the park a “showplace of the City” and to add significant vitality to the area by creating a new open public space. 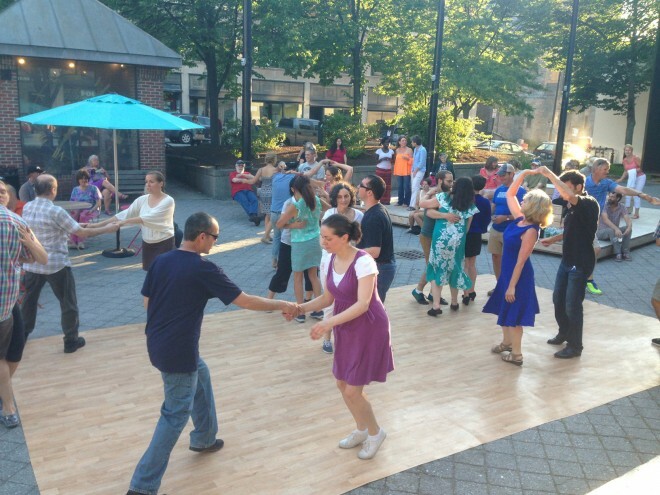 Throughout the 1980s and 1990s the park was programmed by Maine Arts, the Portland Downtown District and other non-profit groups with events such as dances, movies, and concerts, and was a gathering place for residents and visitors. These outdoor events added to the development of Portland’s arts district identity. However, the design of the park – with multiple physical and visual barriers to entry – and the lack of amenities, made organic community use of the park a challenge and, unfortunately, a lasting management structure was never established. As public and private investment in the park declined in the early 2000s, programming was abandoned completely, and a once vital space was allowed to deteriorate. The park no longer felt loved, used, safe, comfortable, or accessible. The City then scuttled plans that were underway to fix it and instead tried to sell it. That was when the Friends of Congress Square Park stepped in. The grassroots organization was born of necessity: with the city on the verge of selling the park to a developer for an event center, the people were faced with organizing or losing a valuable public resource altogether. The Friends of Congress Square Park formed out of interested members of the community - neighbors and local business owners who saw the potential of Congress Square Park specifically, and the value of public space in general. They raised money and attention and started experimenting and gathering partners. 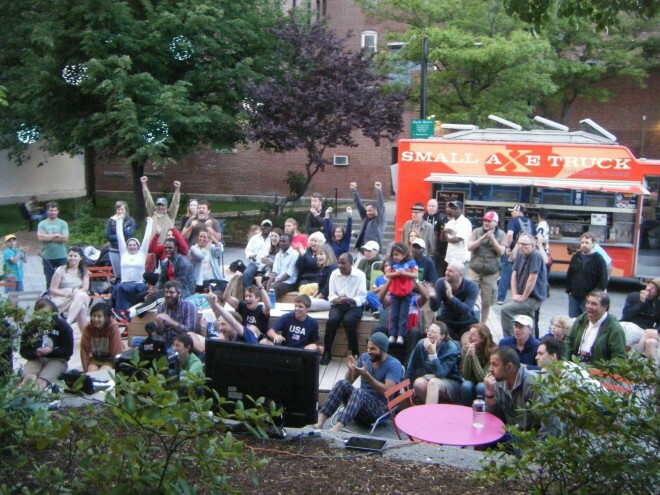 In the lead up to the sale of the space and ensuing community displeasure, the Friends of Congress Square Park invited PPS Senior Vice President Ethan Kent to their city to see the space and speak to members of the community and representatives of local institutions about Placemaking, the importance of public spaces, and the possibilities for the park. 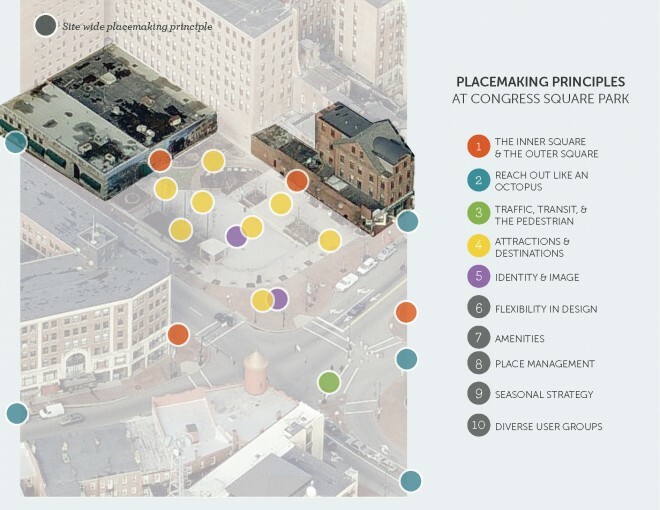 Concurrently, the City of Portland Planning Department conducted a public visioning process to assess the needs and aspirations of the community for Congress Square. Through neighborland.com, Twitter, and with signs strategically placed throughout the city they asked people to respond to the prompt, “I want… in Congress Square”. Their efforts garnered over 650 responses. With those responses in hand, the Friends of Congress Square Park began to implement some of the more immediately obtainable requests, the “Lighter Quicker, Cheaper” (LQC) interventions. 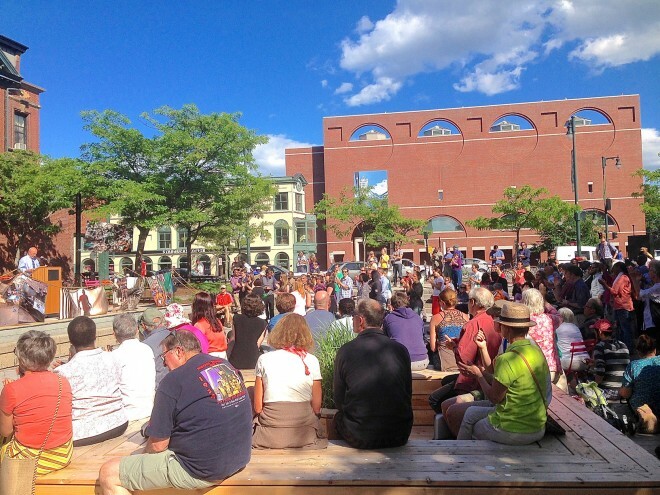 “We saw the potential of Congress Square Park, but knew we had to work quickly if we were going to save it,” says Bree LaCasse, Friends of Congress Square Park board member, “Inspired by the work of Project for Public Spaces, we set to work raising money, establishing partnerships, and adding amenities. 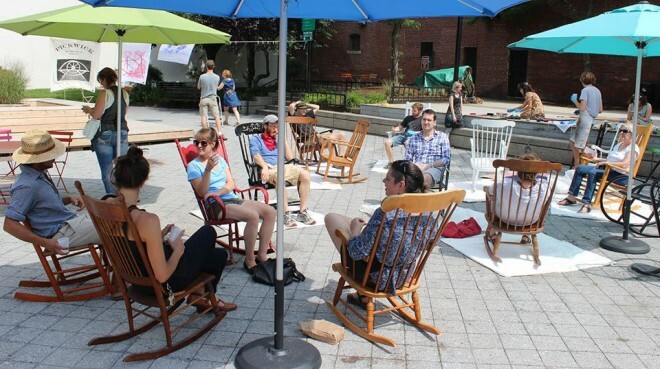 Our first summer of community-led placemaking has been a tremendous success.” With some movable furniture and free WiFi, more people started stopping by. 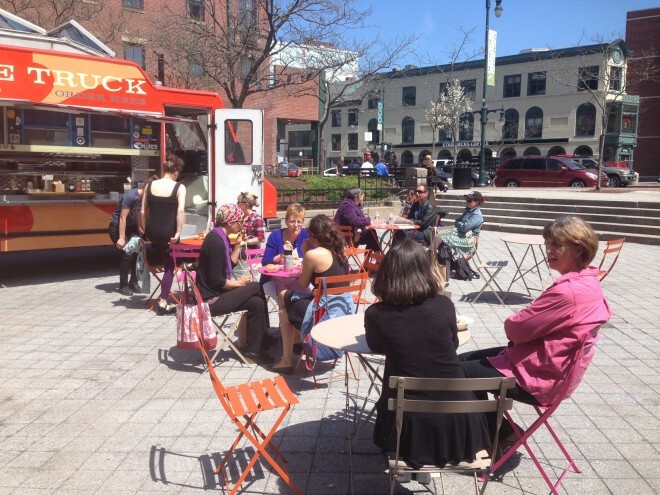 Food trucks brought meals (coffee and doughnuts by Urban Sugar, and nationally acclaimed street food by Small Axe) and meals brought more people. Soon more and more people started coming and staying, populating the square throughout the day with people from the neighborhood who finally had a place to sit outside, read the paper, enjoy a cup of coffee, eat their lunch, or get some work done. It was a square that had been waiting for people and people who had been waiting for a welcoming public space. Take Maureen Hannigan. She has lived in Portland since 1970. She moved into the Congress Square Plaza apartment building four years ago. Two years ago she gave up her car and now walks or rides the bus. As a result, the park has become a daily destination for her. She is overjoyed by the changes she sees happening in the park. “I love going to the park in the morning. 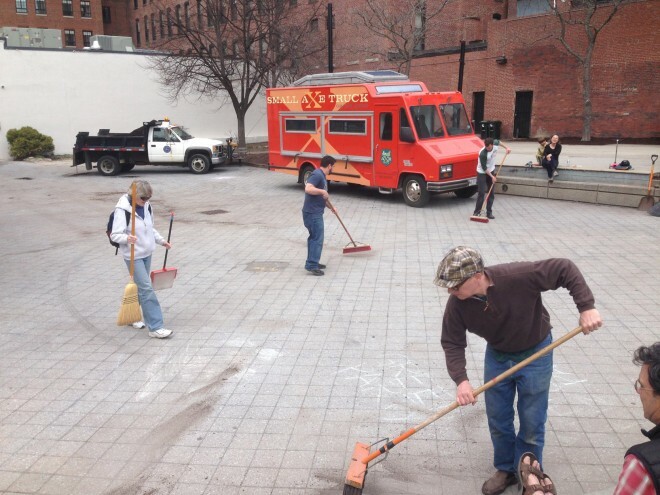 I see the Friends putting out tables and chairs, cleaning up the park – I want to applaud them every time. I’ve never seen a volunteer group take such good care of a park. It makes a difference in the lives of so many people,” remarks Maureen. The sizable crowds at events show that neighbors and visitors are interested in attending such community events, and neighborhood business collaborations show they, too, have a vested interest in those events being successful. One of the Friends of Congress Square Park’s most successful collaborations has been with SPACE gallery – a non-profit contemporary visual and performing art space - to organize the first season of events and art interventions. SPACE’s location near the park makes it a natural partner, but more importantly, the Friends sought a partner with a willingness to experiment and a well-respected track record for introducing the Portland community to new ideas. "SPACE's mission is to present artists to the public in ways that are important to the artists, and the Congress Square Park programming has been a great opportunity for us to connect more people to the artists we believe in working with. Our programs tend to be fun and quirky and a little outside the box, and CSP provides an open testing ground for trying out new ideas,” remarked Nat May, Executive Director of SPACE gallery. As a result of the success, the Friends and SPACE have recently extended the event calendar through autumn. The Friends of Congress Square Park have started putting in place some light infrastructure changes to the park that enliven it, such as the movable planters in the center of the square, and art installations, such as the sculptural light forms by artist Pandora LaCasse that add color, light and form to the back area of the park in the evening. SPACE also commissioned a public art project by Brooklyn based artist Michael Clyde Johnson called “untitled patio with benches and planter” to activate the center of the space and to give people a place to sit and relax. These LQC measures bring life and structure to the park, but offer the Friends of Congress Square Park the opportunity to go back and assess and reassess their success. They’ve been able to harness their success, first with the art installations, movable furniture and WIFI, then the food trucks, the events, and then the planters, to maintain momentum. At the same time, the LQC nature of those successes has allowed them to experiment with little risk, playing off of those successes to build further successes while abandoning projects that haven’t taken off in the same way. In August, PPS worked with the Friends of Congress Square Park to develop some ways in which the ideas of the community could be further integrated into the park. We looked at how some of the great LQC interventions that the Friends had already been working on could become more permanent; how the presence of the square could extend past its physical boundaries to be felt across the street or even further down the street; and how to make the edges more permeable. We also looked at how the Friends could continue to work with the city on managing the space into the future. Congress Square Park is turning into the community asset it always had the potential to be and the community is jumping on the new found opportunity to come together in a great public space. It serves a densely populated neighborhood of retail establishments, commercial properties, educational and arts institutions, and residential housing. It has the highest population density, the oldest age demographic, and the most people without cars of any area in the City of Portland. In fact, there are approximately 10,000 residents within a five-minute walk of Congress Square Park. Congress Square Park is their “backyard” and can provide these residents with important opportunities for recreation, relaxation and interaction. With SPACE Gallery, the Portland Museum of Art, Children’s Museum, two theaters (one large, one small), a number of galleries and music venues, the Cumberland County Civic Center, and the Main College of Art within a three block radius of the square, the possibilities for partnerships in the future seems endless. 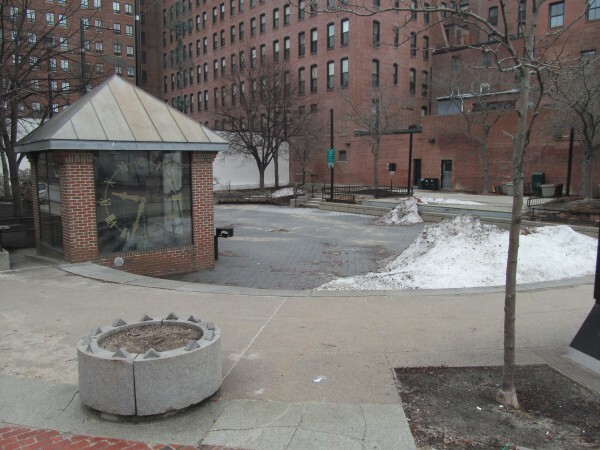 The story of Congress Square Park is still unfinished. With the hard work of the Friends of Congress Square Park, the square is starting to come alive, gain momentum, and to live up to its possibilities as a public space. Friends of Congress Square Park from alex coppola on Vimeo. This article was written by PPS intern Jessica Cronstein and Bree LaCasse of Friends of Congress Square Park.